October 28, 2012 | David S. Maldow, Esq. 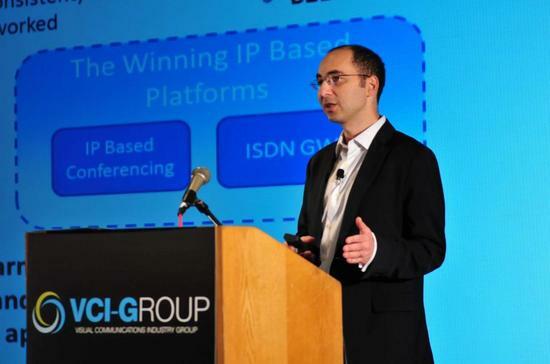 Vidyo's CEO and co-founder, Ofer Shapiro (shown above), presented the keynote address at the October 2012 VCI-Group Annual Conference in Monterey (side note: I found the event to be exceptionally valuable and I will have more to share in upcoming articles). After Ofer gave us his overview on the state of the industry in general, he provided some clarification and insight on recent Vidyo announcements and how they figure into Vidyo's long term strategy for market dominance. There are times when an announcement from a video company stands on its own, and there are times when a little context is needed. Rather than dance around the elephant in the room, I am going just lay it out. Vidyo and Polycom are at war. This is not a friendly competition, they are both going for the throat. As a result, their product/service announcements of late are designed to serve two goals. 1) To announce new products and services, and 2) To attack the products and services of the other company. In the following article I intend to take a good look at what Vidyo's latest announcements mean both in terms of actual product offerings, as well as their implications on this battle for the VC market. A few weeks ago I extensively covered Polycom's massive wave of announcements. Overall, a nice collection of advances, which I expect their users will appreciate. I noted at the time that within the descriptions of their new products were some subtle, and not so subtle, attacks on Vidyo. In particular, the emphasis on the fact that the Polycom iteration of H.264 SVC was available to the world, royalty free, was clearly directed at Vidyo and its proprietary version of SVC. The real world implications of Polycom's decision to give away its SVC code aren't entirely clear. For example, we don't expect Cisco, LifeSize, and Avaya to adopt it immediately, which would help to make it a true standard. If no one else adopts it (other than existing partner Microsoft), then it will only work in Polycom to Polycom calls (or potentially Polycom to Lync), which isn't much better than having a proprietary protocol. Potentially, new upstarts in the market could adopt it, but that remains to be seen. Regardless, the marketing implications were crystal clear. Polycom is "open" and Vidyo is "closed." Of course, this attack is readily countered by Vidyo's explanation for why they keep their SVC iteration proprietary. It has value. Vidyo has a lot of extra features in their SVC (690 patent claims) which are not included in the "basic" SVC protocol. They can make a strong case that their SVC provides a number of serious, real world, advantages over vanilla SVC. But in marketing land, open standards is a winner and closed standards is a tougher sell. Vidyo isn't the type of company to take this lying down, so they have come back swinging hard. Update: Please see the comments below to read a letter from Ofer Shapiro, offering a bit of correction and clarification in regards to which aspects of Vidyo's platform are protected, and which aspects are actually open. Vidyo managed to take some wind out of Polycom's H.264 SVC sails by announcing its work in the development of H.265 SVC. 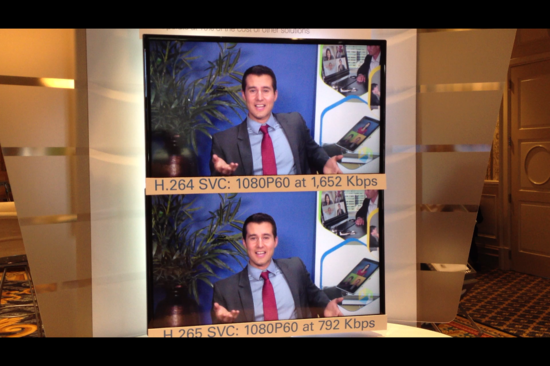 I recently covered Vidyo's H.265 SVC implementation and discussed why SVC will provide the same benefits for H.265 as it currently does for H.264. For those new to the H.265 (aka HEVC) buzz, it promises to offer a 50% bandwidth savings at the cost of additional processing. Vidyo demoed the new capability at the Gartner CIO Symposium and was able to achieve 1080p60 at less than 800 Kbps (see the picture above), with no perceptible loss in quality. Vidyo isn't the only company moving towards H.265, as Cisco recently demoed their own version, which does NOT include SVC. 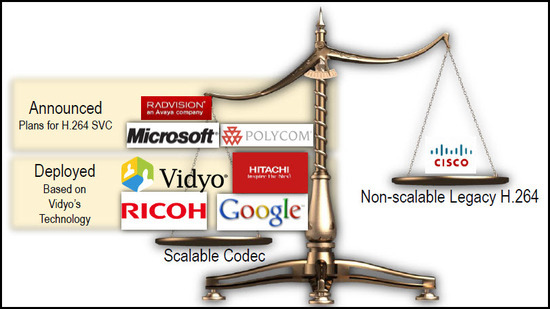 Vidyo shared the graphic below (which needs to be updated regarding the availability of competing SVC solutions) to demonstrate their belief that the future of video is SVC and Cisco is simply fighting the tide at this point. H.265 achieves the 50% bandwidth savings by requiring additional processing power. For hardware companies like Cisco this is a concern, as users may hold off on purchasing today's endpoints, while waiting for new ones that will support H.265. A great Dilbert comic recently addressed this issue. However, for Vidyo this is not a problem. Vidyo is a true software company, which means their users will always be able to get a software update to support new protocols and features. As far as the hardware is concerned, with Intel, Qualcomm, etc. spending billions of dollars in R&D to keep Moore's Law in effect, Vidyo can be rest easy that our hardware interests are being looked after and that their software advances will be supported simply by the normal process of upgrading our commodity PCs, tablets, and phones. Vidyo is releasing a new, open standards-based, multi-protocol conferencing platform. This new media server is available now, and a fully virtualized version is expected to ship in Q1 2013. The platform appears have the capabilities of both the VidyoRouter and the VidyoGateway, but it does not yet appear to have a name (the VidyoGateRouterWay??). However, from the way this product is being described and positioned, I would bet anything that internally they are calling it the RMX Killer. Whether or not this is accurate remains to be seen, but either way it is going to be exciting to watch. Remember those combo DVD / VHS devices? How many people actually got one, as opposed to just paying a service to convert those old VHS tapes? How many people are still using one as their primary device? Ofer declined to name names while presenting the image above at the VCI-Group event, but the analogy to the new capabilities of the Polycom bridging platform couldn't be more clear. The updated RMX really is two bridges in one, and as of now it doesn't even allow mixed meetings between the SVC and AVC endpoints. The RMX capacity can be configured to allow more AVC connections by offering less SVC connections (or vice versa), but you can't simply determine your AVC and SVC needs independently and provision accordingly. One is always tied to the other. Whereas with the new Vidyo Platform, you can provision for exactly the number of SVC connections you need and exactly the number of AVC connections you need, without regards to each other. Bottom line, Vidyo is trying to provide a cleaner migration path from AVC to SVC, without asking users to throw away their installed base of video systems. In addition, Vidyo claims to have a serious price advantage, when comparing port to port. For SVC connections, the RMX could run at about $2,000 per port (depending on configuration), while the Vidyo's SVC "VidyoLine" licenses are priced at $950. The disparity in AVC connection prices is even more dramatic, with the RMX's price per AVC port potentially costing $6,000 while the Vidyo platform will come in at $1,200 (this will drop to $600 for the virtualized version). So much for the claim that Vidyo's big weakness is the cost of their gateway connections. Another piece to the puzzle is the VidyoWay service, which allows AVC and SVC connections at no cost. I invite any readers from team Vidyo to help clarify, in the comments below, why some customers will chose the new platform and others will use VidyoWay. The next item on Vidyo's chopping block is Polycom's new VisualEdge Executive Desktop device (shown above). This $3000+ device is pretty sweet. It sits on your boss's desk and serves as both her PC monitor and a high performance video system. It has been well received by the analyst community, with some even complimenting it as being "Apple-esque." But you know what is even more Apple-esque? An iMac. Don't get me wrong, Polycom has is a world class hardware development shop, and I have always liked their devices. Their starfish phone is iconic. But as Ofer likes to say, "Vidyo's hardware department is Apple and Samsung." I must admit, I am a big fan of Ofer's hardware department, and I am certainly not alone. Vidyo could have simply suggested getting your boss a new iMac with a standard Vidyo license and called it a day. Instead, they decided that in order to compete with Polycom's champagne and caviar executive toy, they wanted to introduce a champagne and caviar executive Vidyo license. They call this the "Vidyo Executive Desktop" and they are marketing it to be run on that new iMac or whatever fancy PC your boss prefers. At $750, plus the price of the iMac, it still costs less than the Polycom model (and you get an iMac). Vidyo also claims that the Executive Desktop license on the iMac (or power PC of choice) will outperform the Polycom device, due to the use of Vidyo's SVC and support for 1440p resolution (the advantages of which I describe below). Finally, the license isn't tied to the hardware, it is tied to the person. So when your CEO goes home, she can use her Executive Desktop license on her home device of choice, as opposed to lugging the Polycom device around. In addition, the Executive Desktop offers the user a guaranteed dedicated line. To fully explain this, I need to take a quick minute to go over the Vidyo pricing model. In a standard Vidyo deployment, you don't pay per user, you pay per "VidyoLines" which are shared between users. Think of it as paying for capacity, rather than paying for user accounts. Whether you have 10 employees, 50 employees, or 100 employees, if you only expect that 10 will be making calls at any given time, you pay for 10 VidyoLines which are shared among ALL your employees. It doesn't matter which employees are making calls at any moment in time, the only limitation is that you can't have more than 10 connections going at once. If usage goes up, you just buy more VidyoLine licenses, which are added to the pool shared by your users. A VidyoLine generally costs $950, which means an Executive Desktop license is actually cheaper than a getting an additional VidyoLine. Of course, the fact that the VidyoLine floats between users means, in reality, it is much cheaper than $950 per user. The Executive Desktop license is NOT shared between users, but it does provide guaranteed access. Even if your 10 VidyoLines are being used, your Executive Desktop can still connect, no matter what (it's good to be the boss). "I'm not seeing the purpose of that much resolution (yet)." "I don't think [Polycom and Radvision] can decode 1440p, but is there a need for that, at least for the next 2-3 years?" There actually is a real world benefit in today's world for 1440p video support. Team Vidyo has struggled to explain the value of 1440p, but their use of terms like, "asymmetric encode and decode" are being lost on the less technically inclined. Let me see if I can help out with a little translation. First of all, it isn't about improving the video we are currently sending, it is about preventing a quality loss when we receive that video and display it in different sizes on our monitors. In particular, it helps during multi-party meetings using the old Brady Bunch layout, or any custom layout where multiple people are sharing the screen. To better understand, please take a look at what happens to your 720p video, when it is sent to a typical 720p multi-party meeting. The four panels are shrunk in both size, and pixel count, by 75% in order to share the 720p frame. This results in each quarter panel only truly displaying a 360p image. We don't immediately notice the quality reduction, due to somewhat of an optical illusion. It has to do with the fact that each image shrinks down in size equally as much as it shrinks in resolution (for the techy folks, the pixel density remains the same). As a result, each quarter panel does not necessarily appear to be suffer a four-fold reduction in quality, despite the fact that we are literally throwing away 75% of our visual data. However, this does raise the potential for keeping and using all that data to directly improve the video quality by a factor of four (in terms of resolution). For example, look at what happens when we use a 1440p solution. This is the value of Vidyo's 1440 support. You get to use every single pixel captured by the 720p cameras, even when shrunk to a quarter of the screen. The 75% resolution loss becomes a 0% loss. I suppose some may say that 360p is acceptable quality at that size. But that is a tough claim after 5 years of The Great Resolution Wars, during which every analyst with a keyboard wrote numerous papers detailing the extensive benefits of HD video. Besides, monitors are getting pretty big. A quarter of the typical desktop screen is about the size of an iPad, which supports resolutions far above even 720p. Anyone who has used a new iPad can verify that the human eye can appreciate much higher than 360p at that size. So why should we be so quick to accept 360p on our desktop in supposedly high definition videoconferencing meetings? I am still not sure that everyone fully understands the value of the quick connect, no client, levering your existing social media, browser based, video dynamic (sure does take a lot of words to describe it). But with Zoom.us offering it for free, Polycom highlighting it in their new CloudAXIS solution, and even BlueJeans quietly offering a WebRTC option, people are starting to realize this could be the next big thing. Vidyo can't always be first to the party, but it isn't too late for them to still get in early on this movement. By offering 1440 resolution, and all the benefits of their special iteration of SVC, they hope to differentiate themselves from the other web browser, social media contact plays and take an early lead. Expect more from me on this new type of solution in the near future. Zoom.us is doing well with it in the free VC arena, and I expect Vidyo, Polycom, BlueJeans, and other enterprise vendors to have similar success with browser based VC in the business world. I know it sounds cliche, but when vendors battle like this, it is just awesome for the actual users of videoconferencing. I refuse to pick a winner, because I don't want either company to win. I want them to keep fighting and continuing to improve the affordability and functionality of all their offerings. Vidyo did a great job of pushing back against the recent Polycom salvo and now the ball is firmly back in their court. I can't wait to see what is coming next. David Maldow, Esq. is a visual collaboration technologist and analyst with the Human Productivity Lab and an associate editor at Telepresence Options. David has extensive expertise in testing, evaluating, and explaining telepresence and other visual collaboration / rich media solutions. David is focused on providing third-party independent analysis and opinion of these technologies and helping end users better secure their telepresence, videoconferencing, and visual collaboration environments. You can follow David on Twitter and Google+. \n\n\nVidyo's CEO and co-founder, Ofer Shapiro (shown above), presented the keynote address at the October 2012 VCI-Group Annual Conference in Monterey (side note: I found the event to be exceptionally valuable and I will have more to share in upcoming articles). After Ofer gave us his overview on the state of the industry in general, he provided some clarification and insight on recent Vidyo announcements and how they figure into Vidyo's long term strategy for market dominance. \n\nThere are times when an announcement from a video company stands on its own, and there are times when a little context is needed. Rather than dance around the elephant in the room, I am going just lay it out. Vidyo and Polycom are at war. This is not a friendly competition, they are both going for the throat. As a result, their product/service announcements of late are designed to serve two goals. 1) To announce new products and services, and 2) To attack the products and services of the other company. In the following article I intend to take a good look at what Vidyo's latest announcements mean both in terms of actual product offerings, as well as their implications on this battle for the VC market. \n\nA few weeks ago I extensively covered Polycom's massive wave of announcements. Overall, a nice collection of advances, which I expect their users will appreciate. I noted at the time that within the descriptions of their new products were some subtle, and not so subtle, attacks on Vidyo. In particular, the emphasis on the fact that the Polycom iteration of H.264 SVC was available to the world, royalty free, was clearly directed at Vidyo and its proprietary version of SVC. The real world implications of Polycom's decision to give away its SVC code aren't entirely clear. For example, we don't expect Cisco, LifeSize, and Avaya to adopt it immediately, which would help to make it a true standard. If no one else adopts it (other than existing partner Microsoft), then it will only work in Polycom to Polycom calls (or potentially Polycom to Lync), which isn't much better than having a proprietary protocol. Potentially, new upstarts in the market could adopt it, but that remains to be seen. Regardless, the marketing implications were crystal clear. Polycom is \"open\" and Vidyo is \"closed.\"
\n\nOf course, this attack is readily countered by Vidyo's explanation for why they keep their SVC iteration proprietary. It has value. Vidyo has a lot of extra features in their SVC (690 patent claims) which are not included in the \"basic\" SVC protocol. They can make a strong case that their SVC provides a number of serious, real world, advantages over vanilla SVC. But in marketing land, open standards is a winner and closed standards is a tougher sell. Vidyo isn't the type of company to take this lying down, so they have come back swinging hard. \n\nUpdate: Please see the comments below to read a letter from Ofer Shapiro, offering a bit of correction and clarification in regards to which aspects of Vidyo's platform are protected, and which aspects are actually open. \nVidyo is releasing a new, open standards-based, multi-protocol conferencing platform. This new media server is available now, and a fully virtualized version is expected to ship in Q1 2013. The platform appears have the capabilities of both the VidyoRouter and the VidyoGateway, but it does not yet appear to have a name (the VidyoGateRouterWay??). However, from the way this product is being described and positioned, I would bet anything that internally they are calling it the RMX Killer. Whether or not this is accurate remains to be seen, but either way it is going to be exciting to watch. \n \n\nRemember those combo DVD / VHS devices? How many people actually got one, as opposed to just paying a service to convert those old VHS tapes? How many people are still using one as their primary device? Ofer declined to name names while presenting the image above at the VCI-Group event, but the analogy to the new capabilities of the Polycom bridging platform couldn't be more clear. The updated RMX really is two bridges in one, and as of now it doesn't even allow mixed meetings between the SVC and AVC endpoints. The RMX capacity can be configured to allow more AVC connections by offering less SVC connections (or vice versa), but you can't simply determine your AVC and SVC needs independently and provision accordingly. One is always tied to the other. Whereas with the new Vidyo Platform, you can provision for exactly the number of SVC connections you need and exactly the number of AVC connections you need, without regards to each other. Bottom line, Vidyo is trying to provide a cleaner migration path from AVC to SVC, without asking users to throw away their installed base of video systems. \n\nIn addition, Vidyo claims to have a serious price advantage, when comparing port to port. For SVC connections, the RMX could run at about \$2,000 per port (depending on configuration), while the Vidyo's SVC \"VidyoLine\" licenses are priced at \$950. The disparity in AVC connection prices is even more dramatic, with the RMX's price per AVC port potentially costing \$6,000 while the Vidyo platform will come in at \$1,200 (this will drop to \$600 for the virtualized version). So much for the claim that Vidyo's big weakness is the cost of their gateway connections. Another piece to the puzzle is the VidyoWay service, which allows AVC and SVC connections at no cost. I invite any readers from team Vidyo to help clarify, in the comments below, why some customers will chose the new platform and others will use VidyoWay. 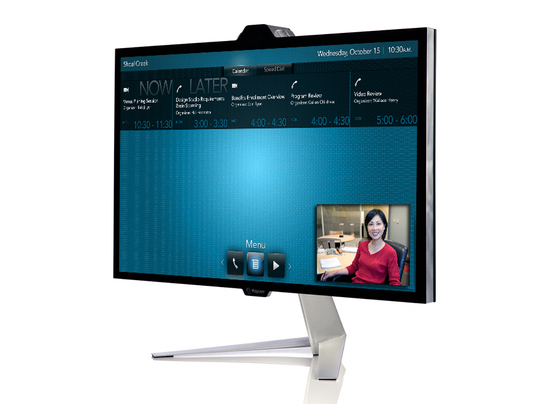 \nThe next item on Vidyo's chopping block is Polycom's new VisualEdge Executive Desktop device (shown above). This \$3000+ device is pretty sweet. It sits on your boss's desk and serves as both her PC monitor and a high performance video system. It has been well received by the analyst community, with some even complimenting it as being \"Apple-esque.\" But you know what is even more Apple-esque? An iMac. Don't get me wrong, Polycom has is a world class hardware development shop, and I have always liked their devices. Their starfish phone is iconic. But as Ofer likes to say, \"Vidyo's hardware department is Apple and Samsung.\" I must admit, I am a big fan of Ofer's hardware department, and I am certainly not alone. \n\nVidyo could have simply suggested getting your boss a new iMac with a standard Vidyo license and called it a day. Instead, they decided that in order to compete with Polycom's champagne and caviar executive toy, they wanted to introduce a champagne and caviar executive Vidyo license. They call this the \"Vidyo Executive Desktop\" and they are marketing it to be run on that new iMac or whatever fancy PC your boss prefers. At \$750, plus the price of the iMac, it still costs less than the Polycom model (and you get an iMac). \n \n \n\nVidyo also claims that the Executive Desktop license on the iMac (or power PC of choice) will outperform the Polycom device, due to the use of Vidyo's SVC and support for 1440p resolution (the advantages of which I describe below). Finally, the license isn't tied to the hardware, it is tied to the person. So when your CEO goes home, she can use her Executive Desktop license on her home device of choice, as opposed to lugging the Polycom device around. \n\n\nIn addition, the Executive Desktop offers the user a guaranteed dedicated line. To fully explain this, I need to take a quick minute to go over the Vidyo pricing model. In a standard Vidyo deployment, you don't pay per user, you pay per \"VidyoLines\" which are shared between users. Think of it as paying for capacity, rather than paying for user accounts. Whether you have 10 employees, 50 employees, or 100 employees, if you only expect that 10 will be making calls at any given time, you pay for 10 VidyoLines which are shared among ALL your employees. It doesn't matter which employees are making calls at any moment in time, the only limitation is that you can't have more than 10 connections going at once. If usage goes up, you just buy more VidyoLine licenses, which are added to the pool shared by your users. \n\nA VidyoLine generally costs \$950, which means an Executive Desktop license is actually cheaper than a getting an additional VidyoLine. Of course, the fact that the VidyoLine floats between users means, in reality, it is much cheaper than \$950 per user. The Executive Desktop license is NOT shared between users, but it does provide guaranteed access. Even if your 10 VidyoLines are being used, your Executive Desktop can still connect, no matter what (it's good to be the boss). \"I'm not seeing the purpose of that much resolution (yet).\"
\"I don't think [Polycom and Radvision] can decode 1440p, but is there a need for that, at least for the next 2-3 years?\"
\n\nThere actually is a real world benefit in today's world for 1440p video support. Team Vidyo has struggled to explain the value of 1440p, but their use of terms like, \"asymmetric encode and decode\" are being lost on the less technically inclined. Let me see if I can help out with a little translation. First of all, it isn't about improving the video we are currently sending, it is about preventing a quality loss when we receive that video and display it in different sizes on our monitors. In particular, it helps during multi-party meetings using the old Brady Bunch layout, or any custom layout where multiple people are sharing the screen. To better understand, please take a look at what happens to your 720p video, when it is sent to a typical 720p multi-party meeting. \n\nThe four panels are shrunk in both size, and pixel count, by 75% in order to share the 720p frame. This results in each quarter panel only truly displaying a 360p image. We don't immediately notice the quality reduction, due to somewhat of an optical illusion. It has to do with the fact that each image shrinks down in size equally as much as it shrinks in resolution (for the techy folks, the pixel density remains the same). As a result, each quarter panel does not necessarily appear to be suffer a four-fold reduction in quality, despite the fact that we are literally throwing away 75% of our visual data. However, this does raise the potential for keeping and using all that data to directly improve the video quality by a factor of four (in terms of resolution). For example, look at what happens when we use a 1440p solution. \n\nThis is the value of Vidyo's 1440 support. You get to use every single pixel captured by the 720p cameras, even when shrunk to a quarter of the screen. The 75% resolution loss becomes a 0% loss. I suppose some may say that 360p is acceptable quality at that size. But that is a tough claim after 5 years of The Great Resolution Wars, during which every analyst with a keyboard wrote numerous papers detailing the extensive benefits of HD video. Besides, monitors are getting pretty big. A quarter of the typical desktop screen is about the size of an iPad, which supports resolutions far above even 720p. Anyone who has used a new iPad can verify that the human eye can appreciate much higher than 360p at that size. So why should we be so quick to accept 360p on our desktop in supposedly high definition videoconferencing meetings? \nI am still not sure that everyone fully understands the value of the quick connect, no client, levering your existing social media, browser based, video dynamic (sure does take a lot of words to describe it). But with Zoom.us offering it for free, Polycom highlighting it in their new CloudAXIS solution, and even BlueJeans quietly offering a WebRTC option, people are starting to realize this could be the next big thing. 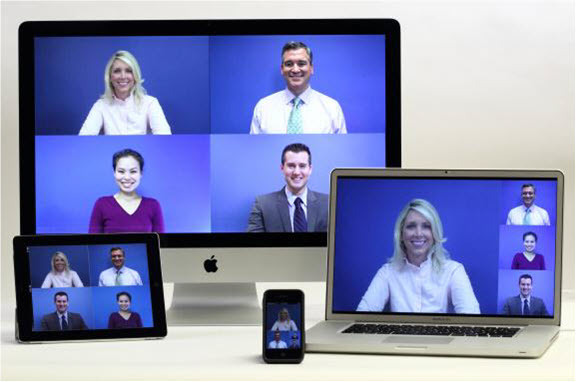 Vidyo can't always be first to the party, but it isn't too late for them to still get in early on this movement. By offering 1440 resolution, and all the benefits of their special iteration of SVC, they hope to differentiate themselves from the other web browser, social media contact plays and take an early lead. \n\nExpect more from me on this new type of solution in the near future. Zoom.us is doing well with it in the free VC arena, and I expect Vidyo, Polycom, BlueJeans, and other enterprise vendors to have similar success with browser based VC in the business world. \n David Maldow, Esq. is a visual collaboration technologist and analyst with the Human Productivity Lab and an associate editor at Telepresence Options. David has extensive expertise in testing, evaluating, and explaining telepresence and other visual collaboration / rich media solutions. David is focused on providing third-party independent analysis and opinion of these technologies and helping end users better secure their telepresence, videoconferencing, and visual collaboration environments. You can follow David on Twitter and Google+.